Scissor over-crossing. Slicing your fingers. Scissor has been dropped and handles are bent. Call Rapid Edge to service, re-balance and re-set your scissor in-salon. Scissor over crossing and noisy. The bump stop is missing. DANGER! Stop using the scissor. Space out finger rings with band-aid, elastic band or nail bar tape as a temporary fix. Call Rapid Edge to replace the stopper. You can ruin a scissor using it without the stop. Scissor under -crossing. Tips not closing. Scissor has been dropped and handles are bent. Call Rapid Edge to service, balance and re-set your scissor in-salon. Noisy/crunchy feeling scissor. Damaged from dropping or using too loose. Call Rapid Edge to service, balance and re-set your scissor in-salon. Scissor won't hold correct tension. Damaged tensioner or lost washer. Call Rapid Edge to fix the tensioner, service, balance and re-set your scissor in-salon. Lost or loose finger rest. Not glued in from new. Call Rapid Edge for a new finger rest. We will glue in with the right adhesive. Superglue or nail glue also works well. All scissors with screw in finger rests eventually come loose. Scissor won't stay sharp. Poor sharpen Use a reputable scissor service. Scissor won't stay sharp. Poor scissor. Replace it with a better quality scissor. Scissor won't stay sharp. Scissor used at wrong tension. Keep your scissor correctly tensioned. No matter what scissor you use or who services them, unless you keep your scissors correctly tensioned, problems will occur. It is better to use the scissor tighter, than too loose. RAPID EDGE SCISSOR TENSIONING INSTRUCTIONS. We use gravity as the means to assess correct tension. Using your left hand, hold the thumb ring between your thumb and index finger and point the tip of that blade upright to true vertical. Then, using the right index finger, raise the other [or free] blade to the + position (left image) and allow the free blade to drop. The amount of drop measures the tension. The blade should drop to between 10 o'clock (center image) to 11 o'clock (right image) imagining a clock face behind it. If the scissor does not drop, it's too tight. If it closes completely, it's too loose. A happy medium is what we are after. Once you find your own ideal tension, stick to it, as the scissor will bed into your hand. Scissor pushing hair. Blunt. Tension the scissor. If still pushing the hair call Rapid Edge as the edge has probably "rolled" due to running the scissor loose. Scissor folding the Hair. Poor tension, blunt or chip in blade. Re-tension and if still no good. Call Rapid Edge to service, balance and re-set your scissor in-salon. Make sure you don't have rings on your comb hand as edges are easily damaged due to cutting into rings and combs. Sore hands/ fingers. Bad fitting scissor. Call Rapid Edge to be fitted with the correct scissor for your hands and cutting style. Install proper fitting finger inserts, which are available from Rapid Edge. Have to pressure cut. 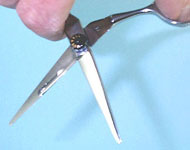 Blunt scissor Call Rapid Edge to service, balance and re-set your scissor in-salon. Scissor pulling on tips. Dropped or incorrect tension. Tension and if no better call Rapid Edge. Sore wrist/ forearm. Poor scissor design. Purchase an ergonomic scissor of the correct style and length to fit your hand. Rapid Edge carries a large range of selected scissors for all hands. As Rapid Edge are Blade-Smiths, not just sales Rep's, we will only recommend scissors that we know we can trust, as we will be the one's servicing them later. Also, most importantly, we carry scissors that the manufacturer backs up with readily available spare parts. Scissor won't slice. Edge damage or tension. Tension and if no better call Rapid Edge. Scissor squeaking. Dirty and/or not lubricated. RAPID EDGE SCISSOR CLEANING INSTRUCTIONS. Scissors should be cleaned and oiled daily. We recommend washing the scissors in scissor oil. Never immerse the scissor in water. 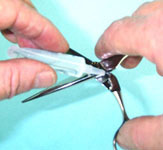 Hold the scissors open with the tips facing down(left image), and apply a large drop of oil to the area before the pivot then open and close the scissor a few times. Gravity will carry the oil through the pivot area and down the inside of the blades (right image) carrying the ground up hair and gunk with it as you work the blades open and closed. Repeat until the oil runs clean. Then, with a clean tissue or towel, wipe excess oil from the scissor. This whole operation takes a minute or two. We recommend either good Camellia oil or our own RE oil, which has the right qualities to look after your scissors. Check the tension. Scissors don't feel smooth. Dirty and/or not lubricated. Clean, lubricate and tension. If still not right call Rapid Edge. RAPID EDGE SCISSOR OILING INSTRUCTIONS. This one can be done in seconds. If the scissors are feeling a bit sticky during a haircut, apply a few drops of scissor oil to the inside of the blades, carefully smearing the oil with your fingers. Then, with a clean tissue or towel, wipe excess oil from the scissor. Check the tension. Scissors corroded. Left in a wet environment. Keep your scissors in a safe and dry environment. Don't immerse your scissors in water. Don't leave your scissors in that classic situation on the towel next to the comb jar. The towel gets moist with water and chemicals and is an excellent recipe for corrosion. Scissors damaged. Incorrect storage. Don not leave the scissors in the trolley amongst the brushes, combs, clipper heads and guards, other scissors etc all nicely topped off with the clippers and or hair dryer laying on top of this mess. If you do use the trolley, create a safe spot where the scissor can be safely placed, and in the closed position please. Scissors dropped. Incorrect storage. Unless the scissors fall out of your hand there is not much anyone can do about this, apart from a chain from the scissor to one of your fingers. This has been tried and it's not practical. If the scissors are left on the bench during and after a haircut you are inviting a drop. A towel covering the scissor will do it, and then the poor junior is blamed for the mistake. The ideal thing to do is to wear a holster and keep the scissors with you at all times. Or put the scissors in a case after use.